Whether you love or hate this puckery, powerful beverage, there are lots of natural health benefits of cranberry juice. 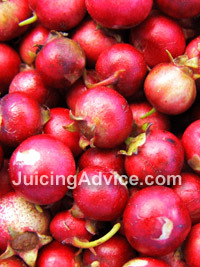 In 1683, American settlers first began making juice from cranberries and it’s a good thing they did! If you’re like most people, you’ve heard the old adage that cranberry juice is the thing to drink when you have a bladder infection. It’s not just an old wives tale! Cranberry juice really can help treat urinary infections, particularly ones that are caused by a strain of E.coli bacteria. There are compounds in the juice that inhibit the ability of the bacteria to adhere on to your cells, and allow your body to flush it out more easily. According to researchers at the Infectious Diseases Society of America, cranberry juice may actually prevent Haemophilus influenzae, a common bacteria present in the nasal cavity of most healthy people, from leading to respiratory and ear infections in children. In their 2002 study, they found that cranberry juice prevented certain strains of this bacteria from adhering to red blood cells and mouth cells. These bacteria have small hair-like structures, called pili, that allow them to stick to the cells and remain in the body. The juice affected the pili, so they could not stick. If you’ve got unwanted fat deposits, cranberry juice could help you shed them. According to nutritionist Ann Louise Gittleman, the high levels of organic acids in cranberry juice have an emulsifying effect on deposits of body fat, particularly when combined with flax seeds or flax seed oil. More Health Benefits of Cranberry Juice! There are more benefits of cranberry juice. Natural cranberry juice is full of vitamins, minerals, antioxidants and phytochemicals, making it a natural defense against heart disease and other common conditions. It also contains compounds that help prevent the growth of bacteria and tooth decay! For the best result, seek out 100% cranberry juice rather than blends, or better yet make your own! If you find the juice too tart, mix it with natural apple juice, and enjoy a healthy, sweeter juice without any added sugar.